Blue Mountains Vietnam Veterans’ Association was formed on ANZAC Day, 1985 as an autonomous, apolitical organization to foster social contact with all who have had any active service, in any service arm or civil capacity, during the period of the Australian involvement in the war in Vietnam. The membership base now extends from Cooktown to Perth and overseas. During 1998, the membership of RAAF Vietnam Association decided that they would like to become incorporated within this association and during 2003 the membership of “Skippy Squadron” Association (former Qantas staff members who flew Department of Defence charter flights in and out of Vietnam during the Vietnam war and have been subsequently awarded the Logistic Support medal and the Australian Active Service Medal), decided that they would like to become incorporated within the Association. The Blue Mountains Vietnam Veterans and Associated Forces Inc. welcomed these decisions. Because of the character of this association, it does not involve itself in any possible controversy on Vietnam or in any other matters relative to any military involvement. This association now places strong emphasis on involvement in members, their families and/or dependent’s welfare/needs in its activities. At this meeting the Association Committee will be elected for the next twelve months. The Minutes of the AGM and the Financial Report will be available on this site as soon as possible after the meeting has been held. 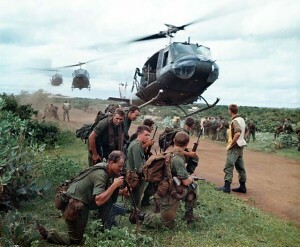 The official date for Vietnam Veterans’ Day is 18 August each year. This is to commemorate the anniversary of the Battle of Long Tan. 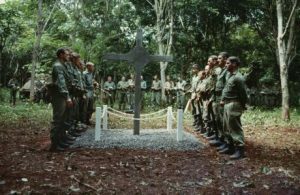 The Battle of Long Tan is the most recognised Australian battle of the Vietnam War. In a decade-long war that, for the most part, consisted of small contacts, Long Tan was one of the exceptions. Our Association will be holding our annual Memorial Day March & Commemorative Service on Sunday 11th August 2019 in Springwood NSW. This is the closest Sunday prior to the official date. A State Government reception is also held annually to honour all those men and women who served in Vietnam.